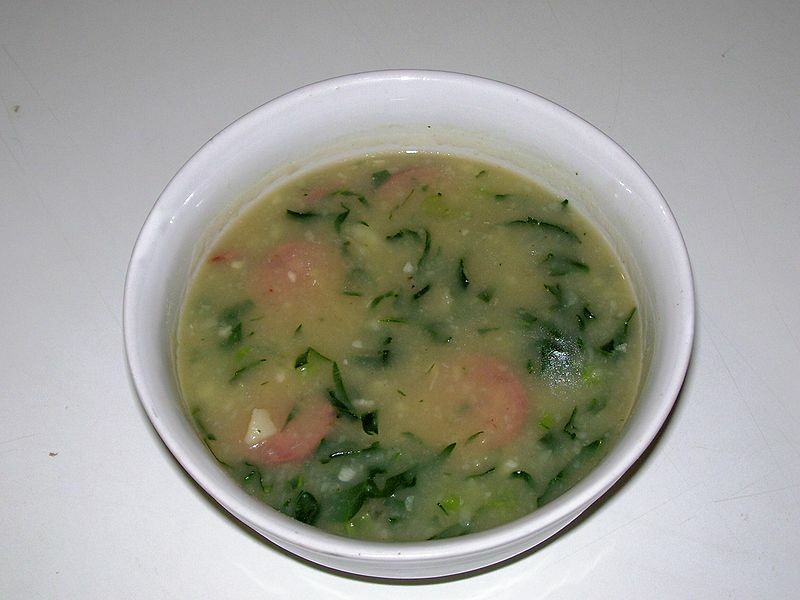 Caldo verde is a popular soup of Portuguese and Brazilian cuisine. The basic ingredients for caldo verde are potatoes, onions and collard greens, savoy cabbage, or kale. Common flavoring ingredients are garlic and salt. Before serving, slices of chouriço are also often added, as well as olive oil. In Portugal, it is typically consumed during festivities, and almost always served with chouriço. It is usually accompanied by slices of Portuguese broa bread on the side. Caldo verde originated from the province of Minho, located in northern Portugal. Although it originated from Minho, it is a national famous recipe used from the very north of Portugal to the south. The love for this soup has spread all over the world becoming a famous symbol of Portuguese cuisine. Since caldo verde is very simple and light, it is often consumed before a main course meal as well as a late supper. Caldo verde is also a favourite choice at many Portuguese festivities, celebrations, and weddings happening everywhere around the world.